The Pascua Militar is a fixed point in the Spanish royal calendar, taking place every January 6th and marking the start of the regal agenda for the year. In recent times, just Felipe and Letizia have been present but just 24 hours after turning 80, Juan Carlos was there, too, accompanied by Sofia. 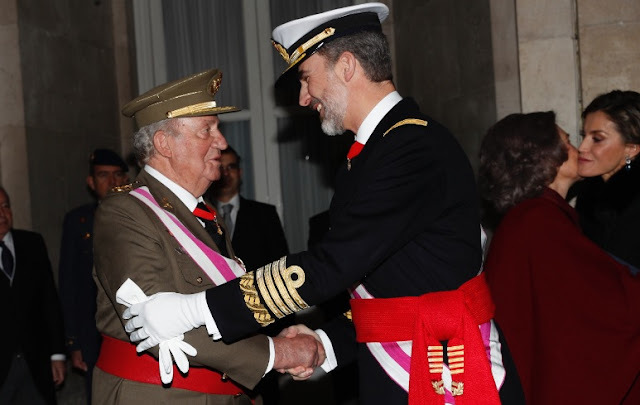 In recent days, the former monarch has been feted in many Spanish papers as his milestone birthday leads to a retrospective of his life and reign. For the first time in a long time, Juan Carlos may well have been the most popular royal in Madrid this morning. 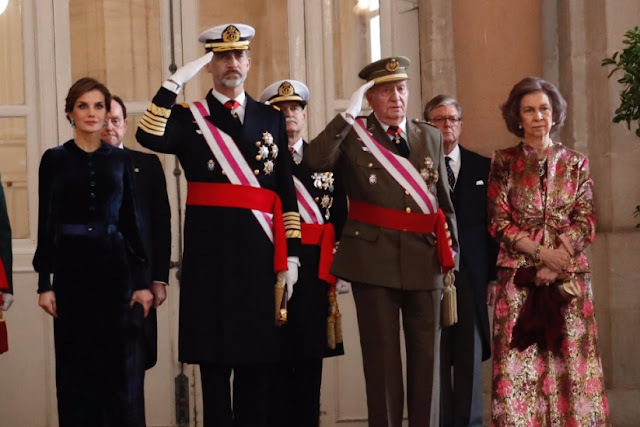 The traditional military parade outside the Palacio Real had to be cancelled because of rain so the first glimpse we got of the two kings together was inside where they took the salute, flanked by Queen Letizia and Queen Sofia. 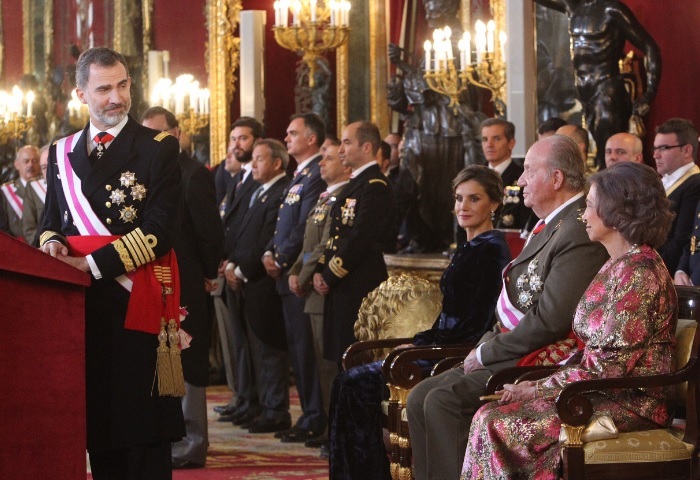 Then it was off to the throne room for the monarch's speech which Felipe VI began with a tribute to King Juan Carlos. There was also the small matter of a lot of hands to shake at the official reception where father and son, two kings together, appeared to be having a marvellous time. It was rather heartening to see the bonhomie between them. It's gala dress time with Letizia opting for midnight blue velvet (rather trendy and rather nice) and Sofia keeping with her own personal traditions and wearing what appeared to have once been a tablecloth. Well, it's her husband's big day, after all. And she appeared to revel in the celebrations going on for him. The couple didn't stop smiling at one another while Sofia looked, dare we say it, really rather proud of Juan Carlos as he made his first appearance at this major event in years. She has every reason to be. One of the most interesting aspects of Juan Carlos' attendance has been the warm welcome it's been given and the rush of positive comments on social media sites. 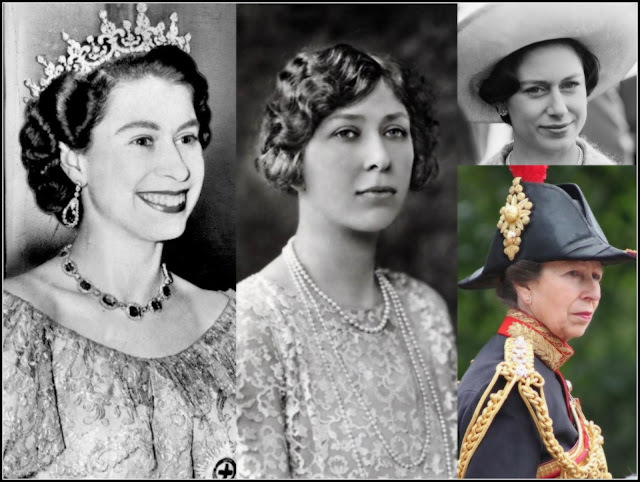 In the past months, just about everything Casa Real has tweeted has led to a string of replies criticising the monarchy. The tweets showing Juan Carlos and Sofia at the Pascua Militar are dominated by positive remarks and lots of optimism about the monarchy. It only makes the decision not to share the birthday photo taken at his 80th celebrations on January 5th even more odd but given the tough time Spain's royals have had recently, they'll no doubt take anything positive and move on from there. We can expect to see a lot more of Juan Carlos and Sofia in the coming months. 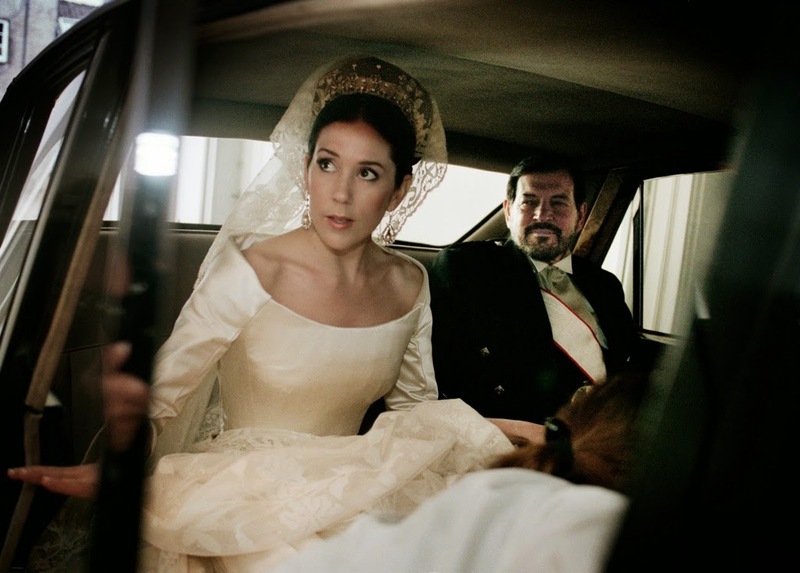 Not only are both of them celebrating their 80th birthdays this year (yep, Sofia too, she looks amazing) it's also the 40th anniversary of Spain's constitution in 2018 and the couple are expected at many of the events marking that. Given the huge row that unfolded in 2017 when they weren't invited to celebrations for the 40th anniversary of the first post Franco democratic elections, despite being instrumental in bringing them about, that's a relief all round. Felipe VI faces a tough year but it seems that dad and mum could be a big help as he faces his challenges. This alternative Day of Kings could be a crucial moment for Spain's royals.